Will people see our talents or should we constantly sell our wares and say look? Look at what I’ve done or what I can do! I think that people tend to take notice of those subtle artists who have other outlets and mostly other motives for creating art in its varied forms. Some artists create because they have something to say. William Faulkner said, “If a story is in you, it has to come out.” They write, paint or sketch because there is that inner drive that will not let them rest until it is done. Something needs to be born and if it resonates with others, then great. If not, that is okay too, because it was something that was going to happen anyway. It is good thing if writers or those other creators of art have other sources of revenue to remain lucrative. Then art can unfold for arts’ sake and not for profit alone. There is less desperation and more true expression. Art often acts as a healing agent. It can help align the artist’s thinking or it might unearth hidden and long forgotten moments of the past. They may resurface as a tale is being told. Sometimes, we are so busy putting one foot in front of the other and we don’t always get the opportunity to stop, reflect and even take note of what has occurred or been learned. We might be more focused on getting away from the discomfort as we evolve and move to the next level. There is a Country and Western song called Can’t You See, written and performed by The Marshall Tucker Band. This guy had been hurt by a woman and he said that he would run until the rails of the train track ran out. Life is like that. We are constantly on the move like a river and we may not always realize how many stories or images have been spun until there is time to pause and put it down in some tangible form. Many writers write to heal themselves of some cathartic need. If their readers happen to gain some new insight or energy from the piece, that is absolutely great. Dr. Maya Angelou said, “There is no greater agony than bearing an untold story inside of you.” It is not about the showcasing or grandstanding; it is about sharing what has been revealed while traveling through life and hopefully a few other souls will be touched along the way. Designing Your Own Book Covers! I was able to assist with the design of the covers of my three self-published works. Creative souls are often able to create on many levels of medium. So, I truly had a hand in deciding what would be on the cover of my books. Companies that self-publish may be more receptive to the writer’s input. I presented my design along with the manuscript to the publishing company and the design team capitalized on that idea. I have found that book covers and titles are extremely important. The images on the cover send an immediate message to the would-be buyer and it has to say something quietly and in a flash. In A Golden Leaf in Time, I designed the cover by cutting and pasting images from the Internet. I sent them four leaves going from green to gold that went across the page and added notes. The design team decided to take the leaves in an upward position which looked more like a branch from a tree. I was quite pleased. The green leaf represents Phoenix’s naiveté and the fact that she was ‘in a pickle,’ so to speak. As she matures and takes responsibility for her state of affairs, the colors evolve, as she does. She reaches a golden state at the end of the novella because she has become the best person that she can be, at that point in her life. The original book had a white background but it was my very first book and there were just too many errors. It bothered me; so almost four years later, I re-invested and wrote A Golden Leaf in Time Revised. This one has a gold background because I wanted to differentiate the two editions. As a former bookseller, I know the power of an eye-catching cover. Adults still like colors and I have seen many of them pick up and purchase books based on their appearance. An attractive book cover can equate the difference between a sale and no sale. When I wrote Traveling Streams: A Reflective Journey, I gave the publishing company my cover design idea, again. This book is about living and writing from various places. It can be described as partial memoirs along with poems, prose and short stories. I chose a globe with a route on it and the publishing company took it from there. I was satisfied! 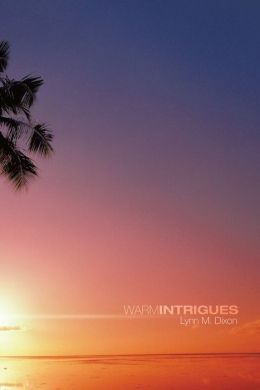 Warm Intrigues is a sequel to A Golden Leaf in Time Revised. With this one, I believe that I simply said that the cover should be something romantic. They chose a tropical scene and it fit because the story ends on the island of Maui. The colors are deep, rich and inviting and it sends the message of warmth. Publishing companies do have design teams, but I think it helps if the writer lets them know what message they want to convey to the readers. I have seen books with the wrong book covers and that can make customers walk right pass a really good book! When writing about a place or scene in a book, it works better for me if I have seen the place and it is even better if I have walked inside of the place. Places and locations have vibrations or what we call vibes, just as people have auras. If a place has a good vibe, it will be positively remembered. A host of adjectives can be used to describe it such as inviting, bustling, busy, active, lively which all give the impression that the place is well-liked by many others who regularly frequent it. And then there are places that are not well-attended by others because they give off a negative vibe, so to speak. It may be described as austere, cold, unwelcoming or sterile. People do not feel comfortable at that location and they probably will not return. Places in book scenes should be described to the extent that others can see, feel and touch it as they read. Most writers use favorable places that have left a good feeling. That place should be revisited, if the place still exists. Sometimes, due the ever-changing world, memorable places are no longer there. I used a footbridge in my first novella, A Golden Leaf in Time Revised. I had used it for years, but it is no longer there. It sat at 57th Street, which took pedestrians across Lake Shore Drive to the beach. But my experiences on the bridge remain, so I kept it in the revision of the book. It was always fun to cross because I knew that I was almost there. There meant at the beach, which was the goal. In spite of the fact that the footbridge no longer exists, I hopefully painted a clear picture of it in the following scene. It was very important to the meeting of two characters. Phoenix is in a good mood as she is walking across the bridge. She does realize that she is being observed. not realizing that she was being observed. For those who used that footbridge that crossed over to Lake Michigan, I would say, “Happy Memories!” For the others, I would say, imagine walking with Phoenix as she walked across that bridge to meet her good! Being in the park on Father’s Day was quite special! The weather was beautiful, sunny, and mildly hot. The stars were truly aligned. Families were sitting on blankets on the grass with spreads of delicious delicacies. They were conversing softly among themselves. It was peaceful and no one was in a hurry. People had plenty of space to enjoy the special day. Some played Frisbee with their children and I happened to be sitting on a bench that faced the scenic, blue Lake Michigan. I could see the quiet sailboats dotting the horizon and I could hear the motorboats as their gunned engines hit the choppy waves. There was a walking trail right in front of where I was sitting. I saw families moving by at a slow pace as they relished every moment of this glorious day. I thought of the word promenade because the families strolled by slowly as they talked with one another and walked with their beautiful, healthy dogs, as well. 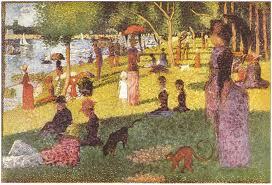 I thought of a painting by Georges Seurat for this was truly a Sunday at the park. His famous work is called A Sunday Afternoon on the Island of La Grande Jatte. It was his largest piece and it now hangs at the Art Institute in Chicago. I saw a play on the life of Seurat and I was reminded of how he took a blank canvas and filled it up with memorable images. The backdrop at the play was a huge white blank piece and as he used his artistry to start a work, it ended up being this historic piece of art. It is so large that viewers feel as if they are there at the park with the others. That is what artists do, successfully. They take an everyday event and recapture the moments in a variety of mediums. The can paint, sing, write, photograph or even pen a poem about what they have seen and heard. Then their audiences can say, “Oh yes, I remember that day!” Art can start many conversations and others may chime in and share what they recall about the event. Several can enjoy the moment but it takes an artist to provide others with that keepsake which allows them to relive those times that have gone by! The World is Too Much with Us! William Wordsworth wrote those prolific words over 200 years ago and they are just as applicable today! In light of the latest horrors in the news, perhaps it is time for us to slow down and smell the roses. When our minds are racing around and we move at a frenzied pace, there are greater chances of faltering and blundering. Every thing that grows takes a rest. The ocean waves ebb and flow; bears hibernate in order to survive and most trees shed the old leaves and go bare until it is time for a new growth. Even music takes pauses and rests. We replenish as we stop, think and reflect. Hopefully, we can then make good choices and decisions that we can live with whether we are seen as a success in the eyes of others or not. Even if we are struggling to make ends meet, living a principled life is a form of success in itself. We don’t have to run and hide because we are ashamed of some hurried choice that we made, which now permeates every aspect of our lives. If we can fall asleep at night with a clear conscience, then, that is a grand form of success as well. Wordsworth warns us that if we become too worldly and too busy attaining things, we may end up losing something of great value. We end up compromising our peace and maybe lose a few special friends along the way. We may have forgotten to respect nature because it teaches us how to have longevity. Or maybe we have forgotten how to love others and in turn, ourselves. Those wiser ones will balance the frenzy of the world by clinging to their faith and finding creative outlets to stop their grasping. There are artifacts, books, poems, paintings and sketches, movies, film and photography to feed some of the soul’s needs in a healthy way. It’s like making choices in the grocery store. Either we buy junk and have temporary satisfaction or we buy fruits, vegetables and other life-sustaining items that help us stay here a bit longer. We have the freedom to choose so that our hearts will not end in a sordid boon. Positive outlets can reassure us that when we lay our heads down on the pillow for the night, we can wrap up in the security blanket of hope, let it hug us and comfort us before we get up and face the world again! Thinking of those in Charleston! Social media has truly enhanced my writing! We often think of writers as people sitting in isolation while writing on a legal pad or typing away on a laptop. But in 2015, I have found that social media has helped me market my writings on Twitter as I attempt to get the word out! And then, there is YouTube. I have added a few music videos to an excerpt from a written piece and it helped set the tone and mood for that scene. The comments were positive and it seemed to work quite well. After all, that is what movie producers do. They add those poignant songs to a touching love scene and it is forever etched in our memory. Though we make take colors for granted, we must realize that we live our lives in color. We do not live and see life in black and white like the old movies. The richer colors, the better. Writers market their books by showcasing their colorful book jackets. The other day, a music video worked for me in another way. First, I heard a song on the radio. I later looked it up on YouTube and the music video inspired me to write a scene that I had not planned to write. I played it several times until I could really see my two characters dancing to the beat. Yes, social media is a great tool for us. It helps us market our artistic pieces whether we text about it, add images or imbed songs. And, on a really creative day, it can be the motivation for writing a beautiful scene that was almost left out! 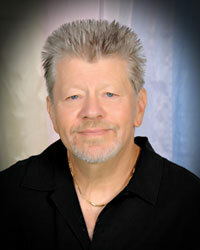 Today, I have the honor of interviewing Paul M. Kramer of Hawaii. I have reviewed a few of his books in the past and they are a mother and an educator’s dream. He tackles issues that all caretakers struggle with such bedwetting, thumbsucking, obesity, bullies and a host of other topics that are rarely written about in such a simplistic format. When did you first know that writing was your artist talent? About ten years ago after writing somewhere about 200 inspiration poems, a little boy who I read a poem to, titled “Bullies” challenged me. He asked me if I write children’s books. I replied, “No, not so far.” He then said, “Why don’t you write a children’s book about “Bullies.” About a year after that, my first children’s book was born. I was told that it was a great first effort and that I definitely had talent for writing children’s books. Since then I have written somewhere about 30 children’s books striving to make each book a future classic. How would you describe your intentions when writing? What messages do you hope to deliver? Below is a Marketing Piece that describes the messages I hope to deliver. “Entertaining and fun to read, more than just a story, more than just a book. Helping kids overcome insecurities,developing self-esteem and a positive outlook. The subject matter is about children’s issues. Who are your targeted audiences? Why? Each book has its individual target audience. Most of my books are geared for children who are in the second grade through the sixth grade. However, I have books like “Thumb Suckers and “Dottie Goes Potty,” that are obviously geared for the younger child. “Why Are We Fat,” can be an effective book for teenagers as well as children. Where would you like your books to be placed for increased readership? Ideally, I would be thrilled if my books were in school and public libraries throughout the US and other English speaking countries. I would of course love them to be sold through book retail stores as well. Which work or works are you most proud of? I consider my books similar to one having several children. You love them all. However, if I had to choose, I would say, “Divorce Stinks”, “Bullies Beware,” and “Maggie Eats Healthier” would rank high of books I am most proud of. A new book coming soon titled “Jenny Cancer Survivor” would definitely be on that list and another new book titled, “Why Kids Lie,” also coming out in a little later on will also make that list. Please add any information that you would like to share about yourself and your books. Paul M. Kramer lives in Hawaii on the beautiful island of Maui with his wife Cindy and their son Lukas. Paul was born and raised in New York City. Mr. Kramer’s books attempt to reduce stress and anxiety and resolve important issues children face in their everyday lives. His books are often written in rhyme. They are entertaining, inspirational, educational and easy to read. One of his goals is to increase the child’s sense of self-worth. Mr. Kramer has appeared on “Good Morning America,” “The Doctors,” “CNN Live” as well as several other Television Shows in the United States and Canada. He’s been interviewed and aired on many radio programs including the British Broadcasting System and has had countless articles written about his work in major newspapers and magazines throughout the world. Visit his website and fill those classroom, school, public and home libraries with these wonderful books! Artists of all types of media are here to offer that aesthetic reprieve for others who are dealing with the humdrums of everyday life. My mother often spoke of how the love stories at the movie houses kept them inspired during World War II. Those stories and images gave them hope and entertained them for a couple of hours as they forgot about the real life events. They truly needed to be transported to another locale and only good art can do that for the populations. Artists’ works shine even more brilliantly in the midst of a huge crisis. Paintings seem deeper in color; writings touch the heart strings and songs end up being the backdrop for everyday life itself. Consequently, artists need space to create these works. Blank pages, blank canvases and blank score sheets must be filled with those words, brush strokes or musical notes. They need physical and mental space to put those ideas into some tangible form. Virginia Woolf wrote a piece called A Room of One’s Own. It is a small book that says that women need money and quiet place to write fiction. She was right because all artists need a writing room, studio or music room to create artistic works and money should not be a major issue. And very importantly, they need an understanding family and mate. If they say they are busy, it should not be taken as a snub because ultimately, the family may be very proud to say that this highly creative person is a part of their family. Thorny Sterling wrote a light, humorous book called How to Live with a Writer. He writes, “If your writer spends inordinate amounts of time staring into space, brace yourself. They have an idea.” So, those who live with an artist must be understanding, secure and selfless. They will know that the change of moods and times of being locked away in a space is a part of the process. They will soon realize that some work is underway and gently close the door as the artist works to entertain others. Actually, they are lucky to reside with someone who has such a huge responsibility and honor that calling by giving them the free reign to make something grand! Tyre and Phoenix have taken a temporary hiatus away from each other after she discovers that he has fathered a child from a previous relationship. She felt that they had shared all of the secrets and hidden things. This catches her off guard and she exits the relationship because she is overwhelmed. What she does not realize is that he was also surprised by the news. He sees her from a distance during the break up. had a stony look. He watched as she headed toward her car. I believe that Donny Hathaway could best speak Tyre’s sentiments if he had a chance to explain his feelings for Phoenix. Listen to “A Song For You “ and see if you agree. Each time we part from our loved ones, we should be mindful of how we treat them. Sometimes, as we rush to get our point across or get our way, we may be unduly abrasive in our dealings with others. And as life would have it, who knows? It could be the last time that we see one another. If we part in anger, we may live with a lifetime of regrets. We may wish that we had been kinder, more understanding or more patient. As we mature, we learn to say less and think more. We cautiously think before we speak because we only hope that there will be an opportunity to make the partings amiable. Shakespeare wrote, “Good night, good night. Parting is such sweet sorrow, that I shall say good night till it be morrow.” Hopefully, there will be a tomorrow. I am moved to write this piece after seeing a play about the life of the soul-stirring singer, Donny Hathaway. I have been listening to his songs which touch me as deeply as they did many years ago. In fact, they probably reverberate even more now that I have lost many loved ones along the way. His song, For All We Know, brought me to an absolute standstill as I grieved for those who are no longer present. However, I often feel their warmth at the most needed moments for comfort and solace. Take a moment, push the arrow below for the YouTube clip and reminisce as Mr. Donny Hathaway sings, For All We Know.